Image: Matias Capizzano. Yesterday I wrote about the youths performing in the local F18 Class, and today Juan Krevisky & Billy Lopez Segura confirmed this generation is preparing a change of guard. 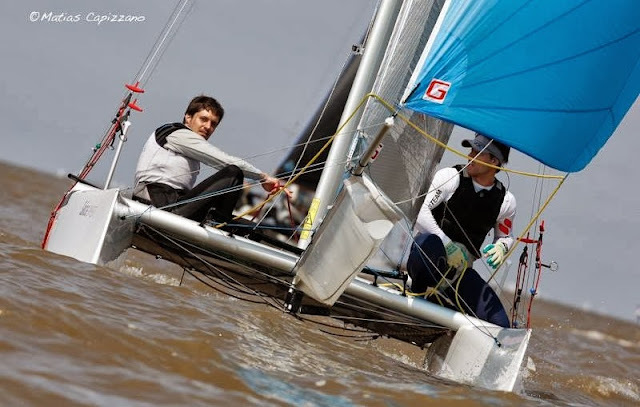 Both come from the 29er fleet, they are South American champs and also won 2 times BA Week in the same class. Now they are leading in the F18 against a now experienced pack of cat sailors. Tied in points with Cruz veterans Gonzalez Smith & Mariano Heuser (Infusion MKII). 5-7knot racing day, light conditions where Krevisky & Segura excelled with 3, 2, 1, 1. Interesting to remark that yesterday they couldn´t not even reach the course area due to some hard 20-25knots breeze. But it was normal as they don´t have many hours together in the Class and they are also racing a recently acquired brand new C2. Juan Krevisky comes from a talented family, his older brother Agustín is Opti World Champ & Vice too. Also one of the best riders in the local F18 now, they bought the boat together, so Arg Nats are his turn to race! I had another awful day in calm conditions, this time I nailed the starts, but couldn´t achieve a thing. We expected more breeze and I left a wrong setting, no pointing , no speed... Dead last. Went from 10th overall to 13th. I think I will leave my spot to Agustín for the Nats, I'm old and lack of training is not helping at all. Best performance I had in the Class was 2nd in this same event back in 2011 with Esteban Blando for the first South Americans. Time to retire..again! Final day tomorrow with 3 races scheduled, although forecast conditions are not looking good , 3-5 knots. Not much F18 images this time. Will try to get some tomorrow.